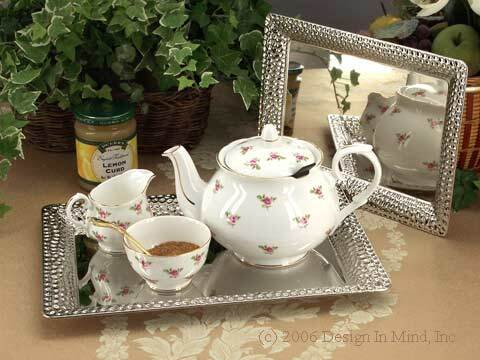 Serving trays are essential for casual tea service. Serving trays are almost essential for serving tea. 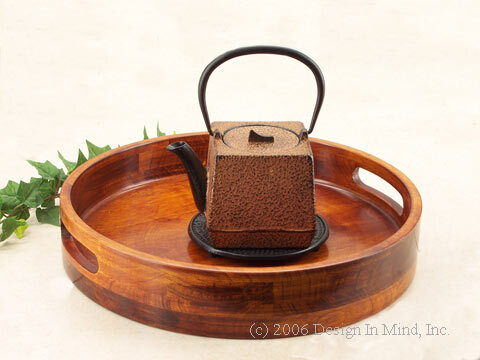 A beautiful tea cozy on a wood tray is elegance. 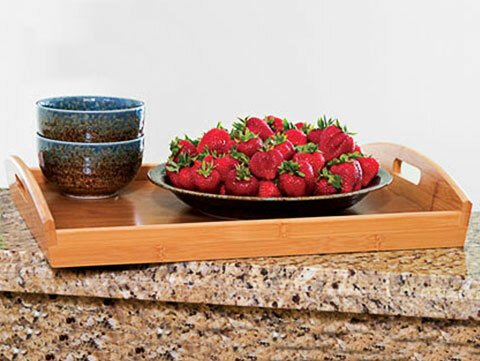 Trays are available in wood, polycarbonate, nickel plated steel and printed laminate styles. Includes 8 heavy paper dinner plates, 8 luncheon plates, and 16 matching napkins. Tray is no longer available. 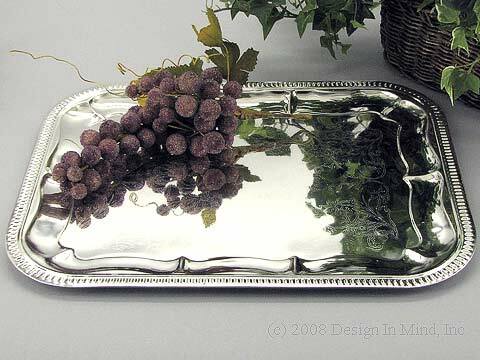 Bright finish rectangular tray from the Sterlingcraft Silver Co. Nickel plated steel, never needs polishing. 16 3/8" x 12 1/4". Bright finish 14" round tray from the Sterlingcraft Silver Co. Nickel plated steel, never needs polishing. 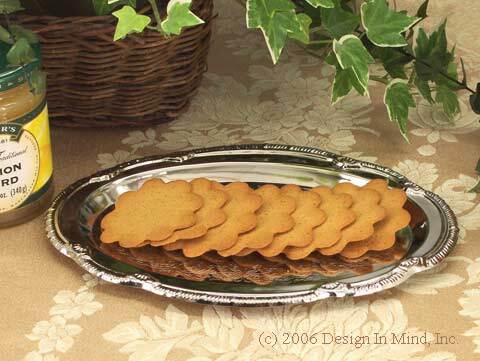 Rectangle tray set with hammered edges from the Sterlingcraft Silver Co. Nickel plated steel, never needs polishing. Use a napkin or doily to protect the trays mirror finish. Large: 14" x 10". Small: 11" x 8". Boxed. 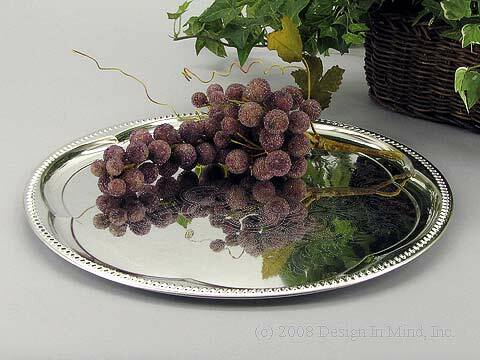 Small oval tray from the Sterlingcraft Silver Co. Nickel plated steel, never needs polishing. 9 1/2" x 6 1/4". 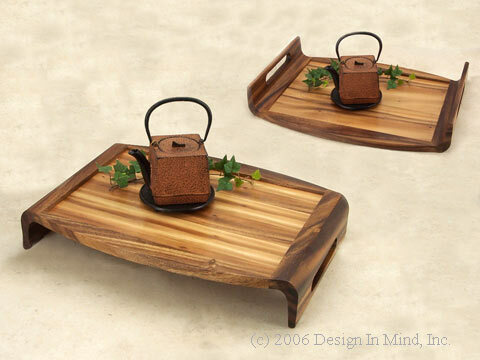 Bamboo Serving Tray with handles...breakfast to dinner, snacks & desserts, afternoon tea. 18 3/4" x 13 3/4" x 3". Hand clean only. Wipe clean with a mild soap and water. Dry thoroughly after cleaning. Rub occasionally with mineral oil to maintain appearance. 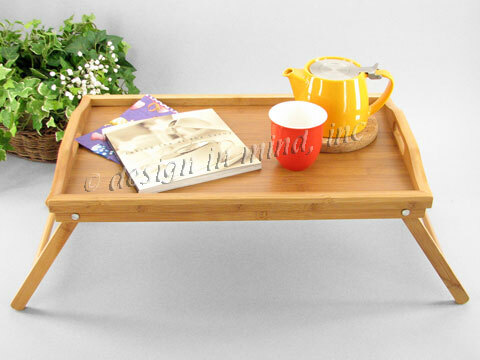 Bamboo Serving & Bed Tray w/folding legs. 19 3/4" x 12" x 9 1/2" open. 19 3/4" x 12" x 2 3/8" closed. Hand clean only. Wipe clean with a mild soap and water. Dry thoroughly after cleaning. Rub occasionally with mineral oil to maintain appearance. 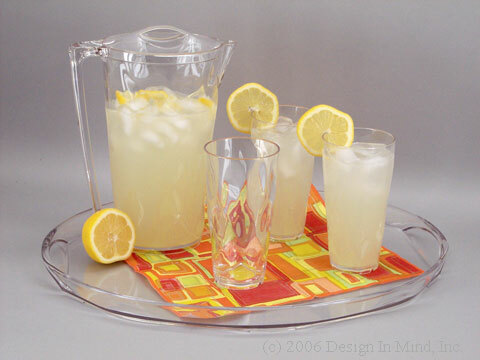 Serve your summertime beverages on this fun iceblocks tray. 20 3/8" x 15 5/8" oval tray has built in handles. Made of clear polycarbonate. Resists cracks and chips. Lightweight and dishwasher safe. Made in the USA. Rich cherry finish round serving tray. All wood hand turned crafted with built in handles. 14" dia. 2 3/4" h.
Hand wash using mild soap and cool water, dry thoroughly. Very simple but elegant styling. Get twice the use from this reversible tray. 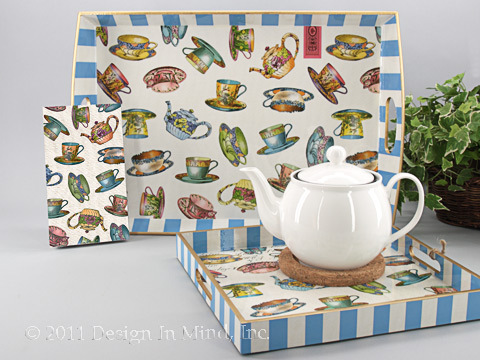 Perfect for holding that first pot of tea in the morning, using as a lap desk, or serving snacks and beverages on the patio. This beautiful tray is made from solid acacia. Enjoy serving on this simple yet elegant tray. 21" x 15" x 3 1/2". Teacups wooden trays, and napkins. 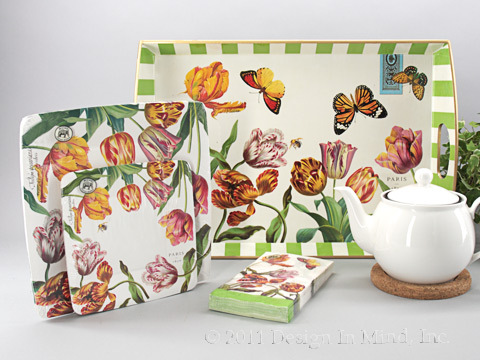 Each tray is hand made, with a decoupaged top and sides, and antiqued edges. Rectangle tray: 20" x 13.75" x 2.75". 32 paper hostess napkins included with each tray. Square tray is no longer available. Soft, triple-ply paper hostess napkins. Folded size: 4.375" x 7.875". Opened size: 13" x 15.75". 16/pkg. Primrose wooden tray no longer available. 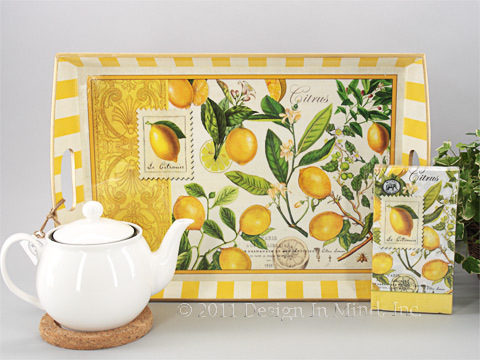 Lemons wooden tray, and napkins. 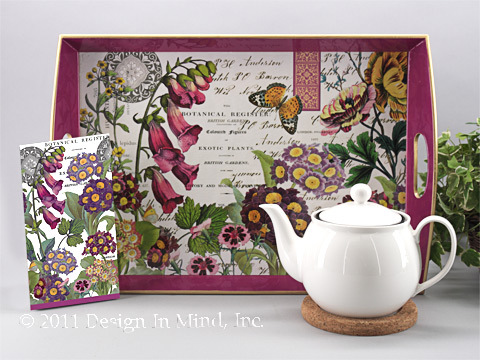 Each tray is hand made, with a decoupaged top and sides, and antiqued edges. Size: 20" x 13.75" x 2.75". Hand clean. Soft, triple-ply paper hostess napkins. Folded size: 4.375" x 7.875". 16/pkg.